DCP wishes to acknowledge and thank The Church of Jesus Christ of Latter-Day Saints for their volunteer efforts on Saturday, March 23, “The Great Day of Service”. This is the fifth year that the Durham LDS members have worked to improve the park. This year they cleared the heavy build up of vegetation under the bridge, and spruced up the SEEDS garden. 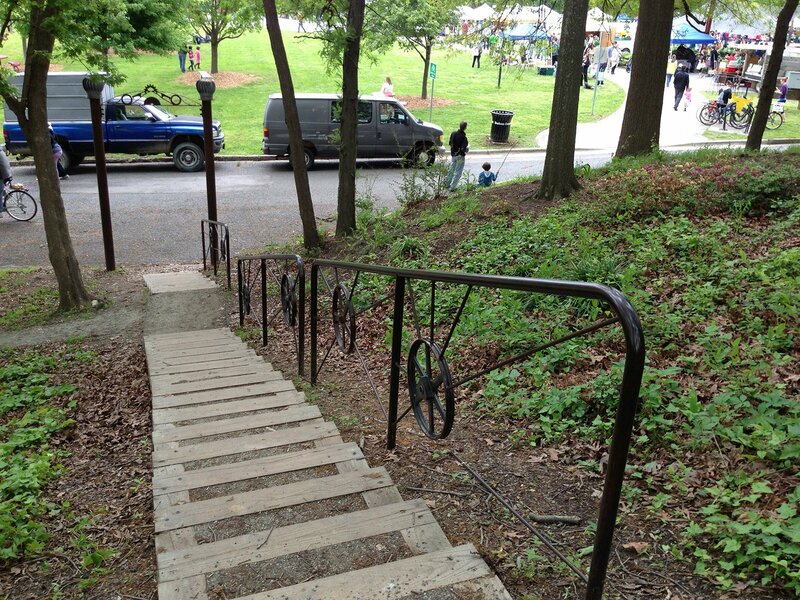 Last year the LDS team constructed the steps that lead from the upper trail to the pavilion. In 2002, a 360 foot long section of Roney Street that ran in the middle of the western side of Durham Central Park was closed to traffic. Barriers and a sidewalk were constructed at the intersection of Roney and Hunt Street. In 2008, Measurement Durham LLC, in preparation for building The Measurement Building, was informed that, legally, Roney Street had never been closed and any development at the Hunt and Roney intersection would need to include “site triangles” to assist traffic pulling out of the long since closed Roney Street. This news prompted Measurement Durham LLC to conduct further research and determined 300 feet of Roney had been voted closed by City Council, but never recorded as such and a 60 feet section of Roney (the section bordered by Measurement Durham LLC and Durham Central Park) was never part of the original closing. Measurement Durham LLC then re-started the road closing procedures and Roney was officially closed by late 2009. During this process, Dr. Henry Scherich, President and Founder of Measurement Durham LLC’s parent company Measurement Inc., held a series of conversations with Durham Central Park Board as to how the road closing and Measurement Building construction could assist the development of the Park. Eventually, the need to soften the severe slope from the former Roney St. roadbed up to the gardens in the western section of the park was identified as a high priority. Due to utility easements, Roney Street could not be completely removed, but it could be narrowed from a two lane street down to one lane. This, combined with excess dirt and topsoil left over from The Measurement Building excavation formed a great opportunity to enhance the Park’s western edge. Measurement Durham and some of its partners agreed to pay for half of the removal of Roney Street and the re-landscaping of the bank above the street, in addition to the in-kind donations of design, project management and the excess topsoil. 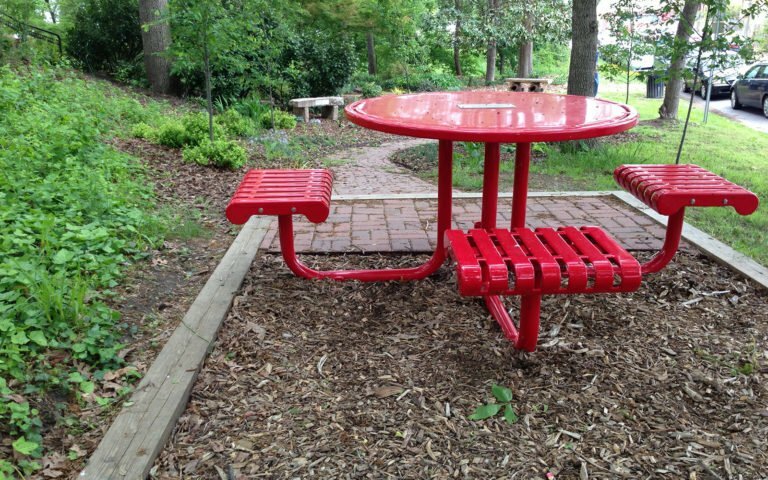 Durham Central Park Board agreed to raise the other half of funds needed for construction. 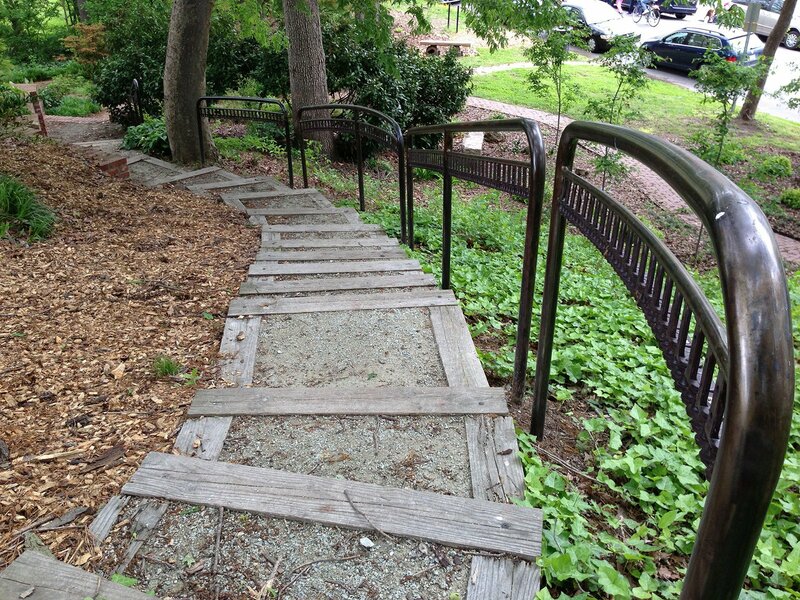 In 2011, Choate Construction Company, Davis Landscaping, and CSSI performed the actual construction of the new, softer embankments and immediately the gardens above became easier to access. 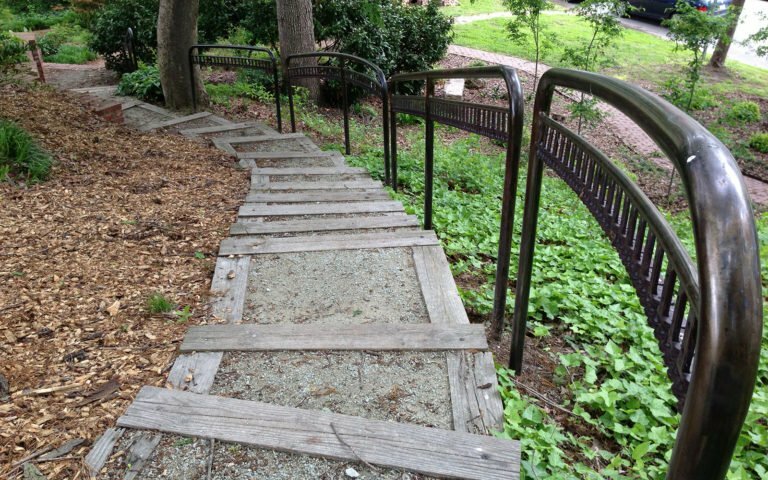 Roney Street, which once were a barrier to the gardens from the rest of Durham Central Park, now links the gardens and DCP together creating a safe and pleasant walkway for all to enjoy. Come play and eat in the garden! The gardens at Durham Central Park are beginning to burst with color, texture, smells and also some yummy items! At the southwest side of the park on Hunt Street is the Garden of Eatin’, an edible garden managed and maintained by SEEDS (South Eastern Efforts Developing Sustainable Spaces, Inc). This is another creative relationship that DCP has with a community partner to sustain the park and develop interesting gardens throughout. The way that SEEDS got involved with DCP is a typical story of how things happen at the park. Someone comes up with the germ of an idea; folks take it and mold it into something exciting; and then Durham Central Park just gets better and better! It all began with the creation of the Durham Farmer’s Market in the early 2000’s. Brenda Brodie, one of the original founders of SEEDS had the idea for a farmer’s market. They started small on Orange Street in downtown Durham and eventually the DFM became its own entity. She and photographer Amanda Berg also made a video about the experience. Check out the video below. 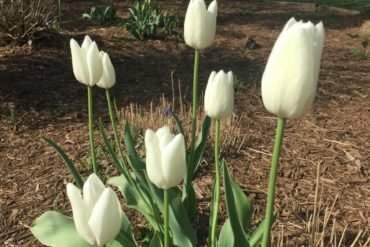 If you are a regular visitor to Durham Central Park, you may have noticed that the plant beds along the west side of Foster Street and the Grace Garden (in the northwest corner of the park on Roney street) have become much more beautiful in the past few years. That’s because Jonathan Nyberg and Rebecca Wellborn of Meadowsweet Gardens & Patios ( www.meadowsweet.biz) have informally adopted Durham Central Park as their latest community project. And we are SO happy they have! DCP is not the first project Rebecca and Jonathan have taken on in Durham. Their first foray was planting and maintaining containers at the old Joe and Jo’s, now Bull McCabe’s, where they worked in exchange for food. Then they installed and planted containers for Self-Help Credit Union on Main Street. About 10 years ago they moved their efforts around the corner to the Durham Arts Council where they noticed the sorry state of the gardens outside. Working on a plan with Edith Eddleman (a landscape designer), they installed a beautiful array of flowers and have maintained the plantings there ever since. 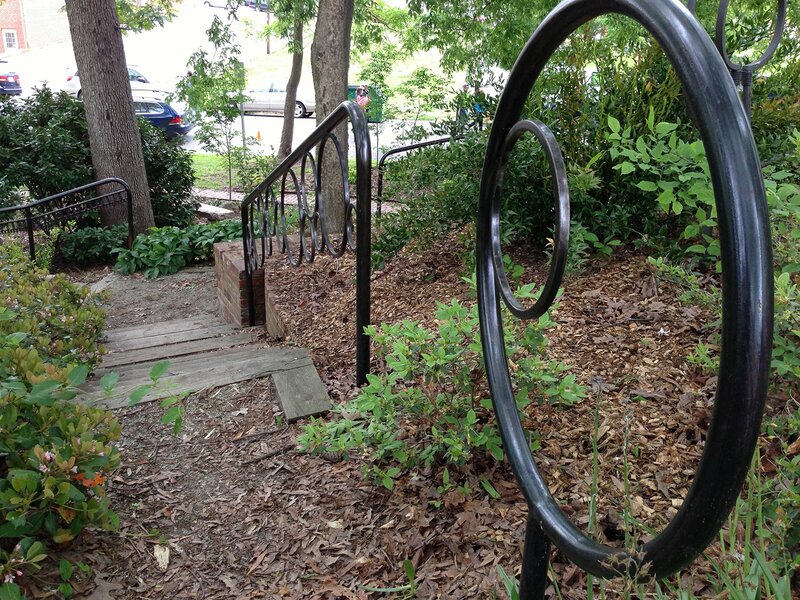 Their first project at DCP was a number of years ago when Rebecca installed and maintained a medicinal plant garden in the SEEDS garden at the south end of the park along Hunt Street. In the past few years, SEEDS has taken over the maintenance of that garden at the park. A few years ago while visiting DCP to go to the farmer’s market or come to an event, they began to notice the planters along the west side of Foster Street were looking a bit unkempt. And another day they noticed that the woody plants in the Grace Garden needed some pruning and the liriope had taken over many of the plant beds. That’s when they decided to move their efforts to DCP. If you happen to see some busy gardeners working on the beds on Foster or the Grace Garden, it’s probably the Meadowsweet gardeners, doing their magic in Durham Central Park. Thank you, Jonathan and Rebecca! Come see us at the park soon! 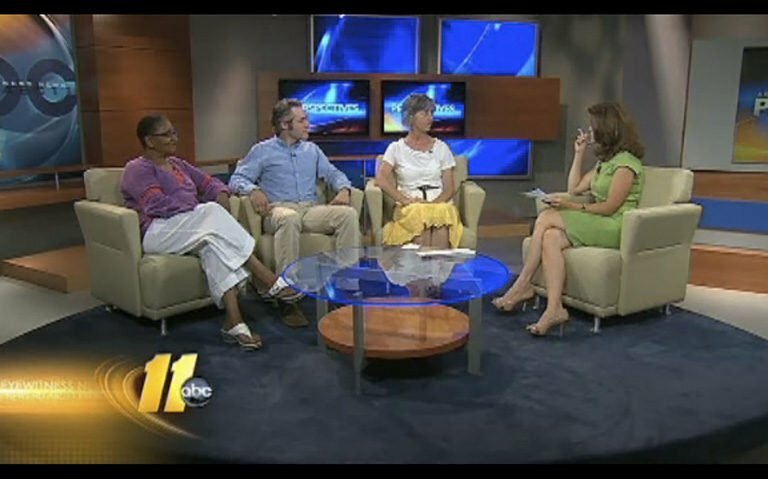 DCP was privileged to be a guest on ABC 11’s “Heart of Carolina Perspectives” show. This years Children’s Independence Day Parade was fantastic! We had great turnout and beautiful weather. Don’t believe us? Check out these photos from Frank Konhaus, Mark Branly and Jody White.